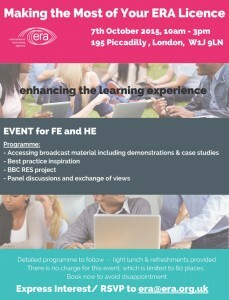 On 7 of October 2015, The Educational Recording Agency (ERA) will host an event for ERA licensees from FE and HE institutions. The event – Making the Most of Your ERA Licence – will focus on how to get the best use out of your institution’s ERA licence. The event will include practical demonstrations of recording and ‘catch-up’ systems, a presentation on the Research Education Space project, and a panel discussion on AV copyright / licensing issues. For more information about the event, please see the pdf ‘save the date’ FE and HE Event Flyer or visit the ERA homepage.